Routine reservoir inspections raised concern regarding the possibility of water penetration through the overflow weir structure at Cantref reservoir. 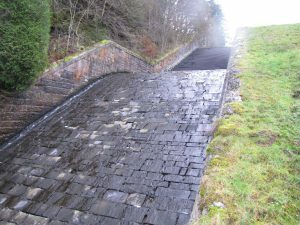 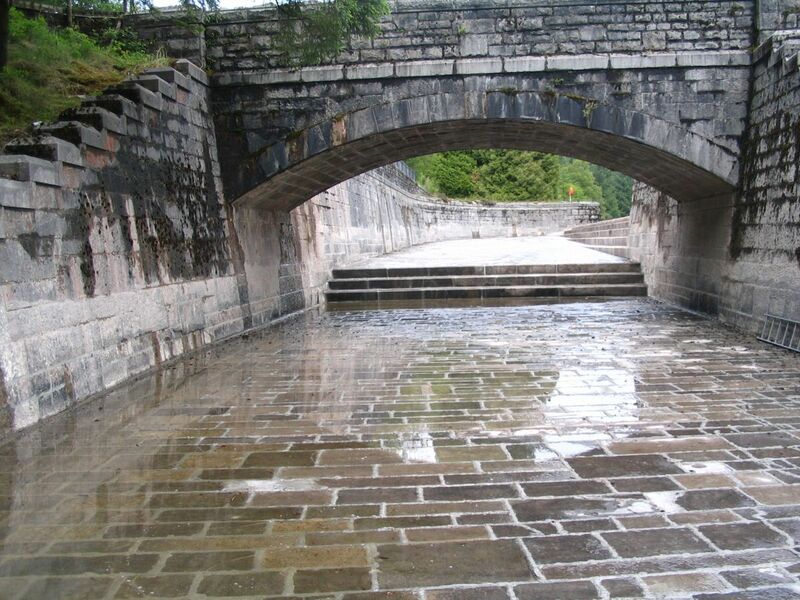 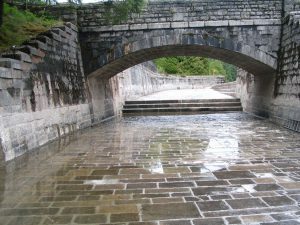 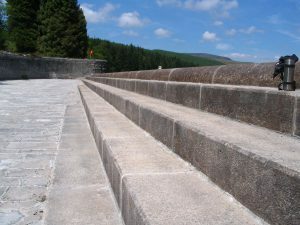 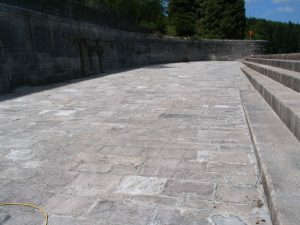 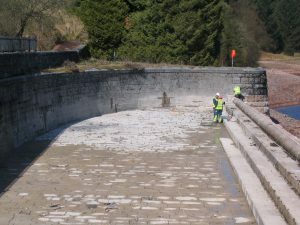 This, coupled with further concerns over open joints in the walls and floor of the spillway below the weir, was such that remedial work was needed and a scheme was raised by United Utilities (acting on behalf of Dŵr Cymru Welsh Water). Following a competitive tendering exercise, Ram Services were appointed as main contractor to undertake all work on site, after water level in the reservoir was lowered sufficiently, work commenced on the overflow weir. 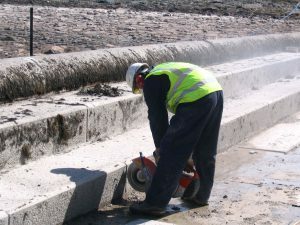 Here, joints in the masonry were opened up and re-finished using pressure pointing techniques, and then cement based grout injected into the core of the weir to fill a number of voids between the substantial masonry blocks forming the weir. 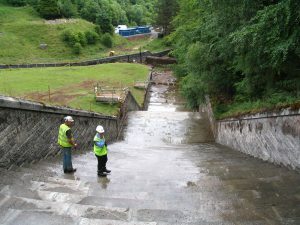 Attention then transferred to the spillway channel downstream of the weir. All joints between pitching blocks on the spillway floor were also opened up (some had voids 25mm wide and up to 300mm deep), prepared by high pressure water jetting, and then fully infilled with new cement based pointing material pumped directly into place. Open joints in the base of the channel walls affected by ground water ingress were also re-pointed, as were bed joints beneath the wall copings where frost had taken its toll. 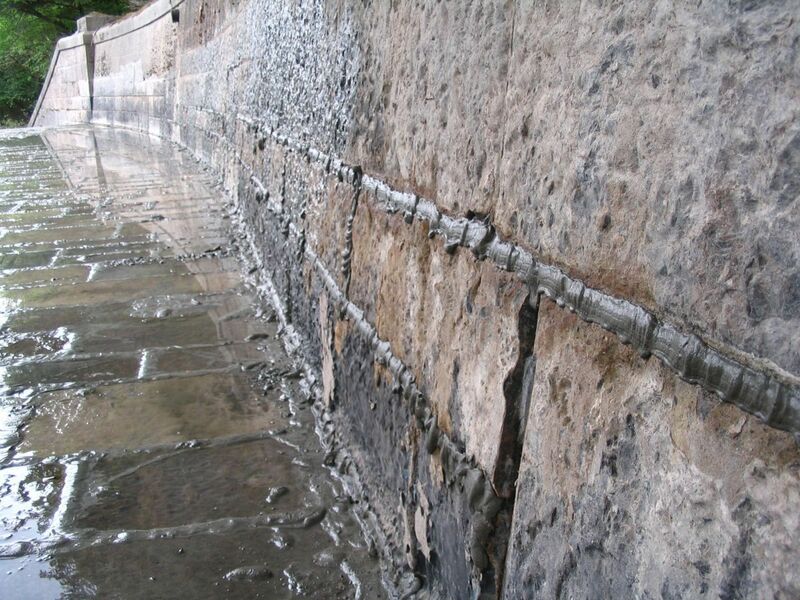 Grout injection was employed locally to fill known voids behind the channel walls, and a series of ground water pressure relief holes then installed in the channel floor. All work was completed to a high standard and ahead of programme by an experienced seven man team.